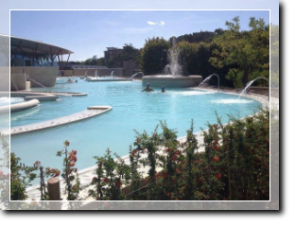 Chianciano Terme is a spa town in southern Tuscany which, like all hot spring areas in Italy, was well known to the Etruscans and Romans in their times. During the 20th century, it became a popular place to "drink the waters" for their health benefits. 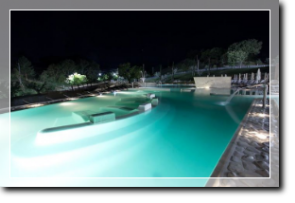 Over the years Chianciano Terme realizes that people are more interested in soaking in hot spring waters than drinking them and a new swimming pool is built using waters from the Sillene hot spring. 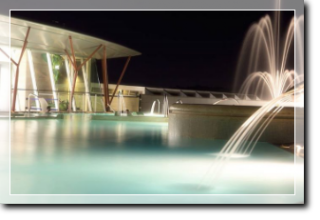 A fabulous idea, building a gorgeous complex of indoor and outdoor pools of various temperatures with jets, waterfalls, and currents. Within the large greenhouse structure with three pools you will be struck by a strong smell of sulfur (rotten eggs) as this is one of the elements of the water in this area. From the indoor pools you can swim outdoors to pools on both sides of the greenhouse structure. On one side there is a very large pool, with an intricate layout of areas with jets, waterfalls, and currents. On the other side there is a smaller pool, but with the highest temperature water. 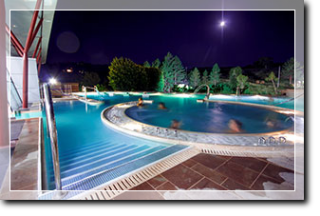 The temperature varies from 33°C/91°F to 37°C/98°F in the different areas of the pools. The water has a sparkling blue-green color, a slightly metallic taste, and a strong sulfur smell. It is rich in carbon dioxide, calcium carbonate, bicarbonate, and sulfates.